Human-computer interaction (HCI) is a rapidly expanding academic research domain. Academic institutions conduct most HCI research…. Human-computer interaction (HCI) is a rapidly expanding academic research domain. Academic institutions conduct most HCI research—in the US, UK, Europe, Australasia, and Japan, with growth in Southeast Asia and China. HCI research often occurs in Computer Science departments, but retains its historically strong relationship to Psychology and Human Factors. Plus, there are several large, prominent corporations that both conduct HCI research themselves and engage with the academic research community—for example, Microsoft Research, PARC, and Google. What Do Academic HCI Researchers Do? 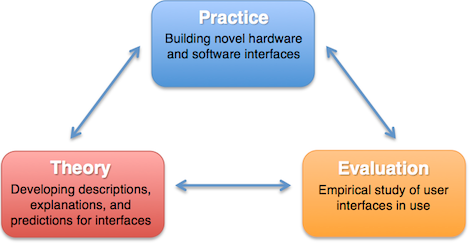 In general, academic HCI researchers do three things, as shown in Figure 1. They innovate novel computing user interfaces through exploratory engineering and by building complex interactive systems—for example, new software applications and infrastructures, wearable devices, and mobile hardware platforms. They develop an empirical understanding of the usage and the user experience of user interfaces—whether through the experimental testing of user interfaces in the lab or qualitative observation of people using user interfaces in the wild, as in ethnographic research. They develop theoretical knowledge about the design and use of interactive digital systems. While there are a few predictive theories—such as Fitts’s law, which describes the relationship between pointer movement and the dimensions of interface elements on a screen—more often, HCI theory takes the form of design frameworks comprising interrelated concepts. HCI research may either focus on one small part of the bigger picture or attempt to address the whole. Is There a Connection Between Academic Research and Industry Practice? Research in both academia and industry often seem to deal with fundamentally similar objects: the understanding and design of interactive digital systems and their human users. UX professionals working in industry also do research—as well as design. While the intended outcomes, goals, and scopes of focus of academic HCI research and UX research can differ significantly, research in both academia and industry often seem to deal with fundamentally similar objects: the understanding and design of interactive digital systems and their human users. Both typically follow user-centered design processes and are advocates for making the understanding of human values intrinsic to the design process. Surely there is—or should be—a strong connection and overlap between the two. In the UK, councils funding academic research have recently raised concerns about how well the connection between academia and industry is functioning. The UK’s Engineering and Physical Sciences Research Council, which directly funds significant portions of HCI research in the UK, have argued that HCI research needs to consider how to “package theories and methods for industry / wider use.”  Further, since academic HCI engages in research in a wide range of target domains—including medical and healthcare technology, consumer electronics devices, and software—the potential payoffs of establishing better ways for academic researchers to engage with UX professionals could be very high. Yet academics often make inaccurate assumptions about what UX professionals actually do and can sometimes take their relationships with them for granted. Academic HCI researchers tend to assume that there is a natural link with industry through which knowledge dissemination and transfer occurs. On the other hand, UX professionals sometimes see academic HCI research as impractical and out of touch with the realities of working in the real world. They may dismiss academic work entirely—or at least find it difficult to digest and apply in their everyday work. The extensive experience of UX professionals working in industry could have as-yet unforeseen significance and implications for HCI research. How might UX professionals educate academia and inform HCI research? What might academic HCI research be able to do for UX professionals? Answering the first question would require HCI researchers to take a keener interest in understanding how UX professionals work and to conduct empirical studies of UX practice. So far, there have been only limited explorations of UX practice. [3, 4, 5] Nevertheless, the extensive experience of UX professionals working in industry could have as-yet unforeseen significance and implications for HCI research. The second question is more complex—in terms of even knowing how to proceed. It also needs deeper investigation. Curiously, academic HCI researchers often express alarm about the sheer amount of novelty and innovation in HCI research, as well as its ever-growing scope. In taking on the requirements of working within an academic discipline, their goal is typically to build strong intellectual foundations that develop incrementally. The innovation and breadth of academic HCI research are actually strengths that contrast with the more limited capabilities of UX professionals working under the constraints of industry…. However, the innovation and breadth of academic HCI research are actually strengths that contrast with the more limited capabilities of UX professionals working under the constraints of industry—for example, working on tightly defined projects with tight budgets and timelines; needing to satisfy clients and stakeholders and mesh with people in other disciplines, such as software developers; and adapting to new ways of working such as agile and lean approaches. Instead of being concerned that there is too much innovation, UX professionals often hope to achieve more innovation within their very different constraints. The outputs of academic HCI research could offer a range of potential value to UX professionals. But how can academia deliver this? First and most obviously, there is no need to tie HCI research either to the requirements for existing or new products or services or to the needs of a specific client. Second, academic HCI has the latitude to explore future technology—design spaces that are inherently more risky and have no clear or immediate payoff. Thus, HCI researchers have the luxury of failing frequently, but also innovating rapidly, working under fewer constraints. 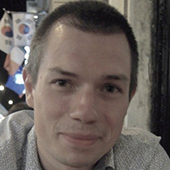 It is perhaps through effectively communicating the outcomes of academic HCI’s explorations of future interactive technologies that academia can offer the greatest value to UX professionals working in industry. Many UX professionals do not have the luxury of time that would enable them to look beyond immediate requirements. But doing research with a broader focus is common in academia. HCI researchers have the luxury of failing frequently, but also innovating rapidly, working under fewer constraints. Unfortunately, at present, most academic work—whether creating prototypes, concepts, ideas, or design principles—is largely imprisoned within the confines of the academic papers that HCI researchers present at conferences and publish in academic journals. HCI researchers’ audience is typically other academics, not people working in industry. By understanding the working world of User Experience, HCI researchers can target their learnings to that audience and establish more fruitful working relationships with UX professionals. Rather than pitting HCI researchers and UX researchers in competition with one another—working under the assumption that one generates authoritative and rigorous knowledge for the other to consume —it would be more helpful to see HCI research and UX research as mutually beneficial disciplines and, potentially, mutually informative endeavors. Taking this approach might lead to academic HCI researchers’ better understanding how they might make their work more accessible and available to UX professionals—in ways that show they are sensitive to the real-world work practices of UX professionals in industry. Unfortunately, … HCI researchers’ audience is typically other academics, not people working in industry. As part of my initial investigations into the topic of this article, I have set up a very brief, five-minute survey that invites UX professionals to provide some information about their background, the methods that they use, and their relationship to academic HCI research. If you would like to participate in this survey—or might be interested in future contact regarding this work—please take the survey now. The author gratefully acknowledges the support of the Engineering and Physical Sciences Research Council (EPSRC). Benford, Steve, and Gabriella Giannachi. Performing Mixed Reality. Cambridge, MA: MIT Press, 2011. Engineering and Physical Sciences Research Council. Report of the Human EPSRC Computer Interaction Theme Day and Survey, March 2012. Friess, Erin. “Personas and Decision Making in the Design Process: An Ethnographic Case Study.” In Proceedings of CHI ’12. New York: ACM Press, 2012. Goodman, Elizabeth. Performance and Materiality in Professional Interaction Design. PhD thesis, University of California, Berkeley, 2013. Gray, Colin M., Erik Stolterman, and Martin A. Siegel. “Reprioritizing the Relationship Between HCI Research and Practice: Bubble-Up and Trickle-Down Effects.” Proceedings of CHI ’14. New York: ACM Press, 2014. Excellent topic! Here is my blog section for UXRPI, the shorthand term we have been using. Read through the blog to get a sense of what people have been talking about over the past 4 years. I think you will see lots of agreement on the situation we are in. And some things people are trying to address the challenges. I will promote your article and survey to keep the conversations going. Also, reference  appears to be from the DIS 2014 proceedings, not CHI. I need to download and read it! A really nice and intelligent article, thanks. In my experience, academic research grants and funding are tied to publications. For HCI to start contributing to practical application in a larger way, we UX professionals in applied practice would need to demonstrate the value of inclusion in these publications. Good food for thought!